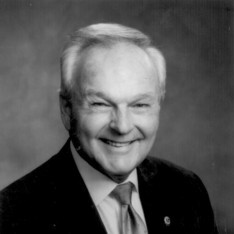 Donald E. Banker was a Charter Life Member of the West Torrance Lions Club, where he had 46 years perfect attendance. In June 1991, he was elected the 75th President of the International Association of Lions Clubs at the Association’s 74th Annual Convention in Brisbane, Queensland, Australia in June 1991. As President, he served as Chairman of the Board of Directors and as official ambassador, visiting Lions’ community projects in 103 countries and geographic locations. As ambassador, he met privately with government and religious leaders including Pope John Paul II and Pres. and Mrs. Bush. He served on the International Long-Range Planning Committee for three years and as its Chairman for one year. He also served on the Board of Trustees of the Lions Clubs International Foundation for four years and as its chairman in 1992-1993. Don was a member of the SightFirst Advisory Committee for two years and was chairman in 1992-1993. He was reappointed to that committee for 1994-1995. He was reappointed to the International Board of Directors by President Coffey for 1993-1994, where he served on the Finance and Headquarters Committee. For his many contributions to the Association, Past President Banker received a Key Member Award, 14 International Presidents Awards and the Ambassador of Goodwill Award, the highest honor granted by the Association to its members. He was also a Melvin Jones fellow. Don was honored twice with Resolutions of Commendation from the combined legislatures of the California State Senate and Assembly. He was instrumental in the formation of the Southern California Lions Eye Institute in Santa Monica and was a member of its Board for many years. He was a founding director, President and CEO of the Lions Camp at Teresita Pines in Wrightwood, California. The non-profit Camp provides year-round recreational cabins and facilities for the disabled of all ages, and is also available for club functions, retreats, conferences and youth groups. Teresita Pines hosts the Southern California location of the Lions Wilderness Camp for Deaf Children, founded in 1980. Don Banker led the West Torrance Lions Club to be the largest founding supporter, donating 1/8 of the initial funds and equipment. Under his leadership in 1992, Lions Clubs International entered its first float in the Tournament of Roses Parade on New Year’s Day. Lions Clubs continued this tradition for 20 years. Don was District Governor of Lions Clubs District 4L-3 in 1970-1971. As Governor, Don spearheaded a drive to acquire their first Mobile Screening Unit (MSU). Member Clubs use the MSU to provide free sight and hearing screening services to the commmunity. Don was always active in his community and served as President of the Rolling Hills Little League. He was a member of the Holy Trinity Catholic Church in San Pedro, serving as a Eucharistic Minister, a lector, choir member and President of the Married Couples Club. Don passed away on Easter Sunday 2010. He leaves Diane, his devoted wife of 46 years, and a loving family and many friends who will always love him, miss him and remember him as a very special person.